Window Cleaning – we clean all commercial windows, inside and out, on a monthly or regular as specified by the customer. We use pure water fed poles and can clean windows, glass, signs, atria, skylights, canopies and facades up the 65 foot in height. 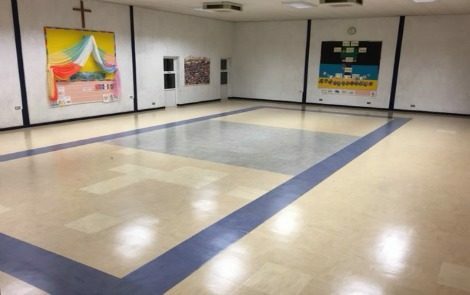 Floor Cleaning – all types of hard floors need to be cleaned and refurbished to maintain that new look: this requires daily or regular maintenance, including spray burnishing. We also offer periodic machine scrubbing and resealing of floors, including wood, laminate and stone flooring. This means the floor surface can be stripped of all ingrained marks, and then coated with a quality sealant or polish, which is long-lasting and brings surfaces back to looking like new. You can see the results we are able to achieve in the image above. Carpet Cleaning – for deep cleaning of carpets where the dirt has penetrated the carpet pile, we use the Hot Water Extraction method. This uses a hot water pressure rinsing system and wand, with active pre-spray chemicals. In heavy traffic areas which need to be cleaned quickly and regularly, we use the Bonnet method. Rotary machines with double sided pads are used with cleaning fluids dispensed from a trigger spray. Deep cleans – one-off cleans following new builds or trades working on your premises. One-off cleans for clients holding special events. Specialist cleaning jobs tailored to client’s specific requirements. If you would like to discuss any of the above services with us then please do get in touch and we’ll be happy to answer any queries or provide you with a quotation.